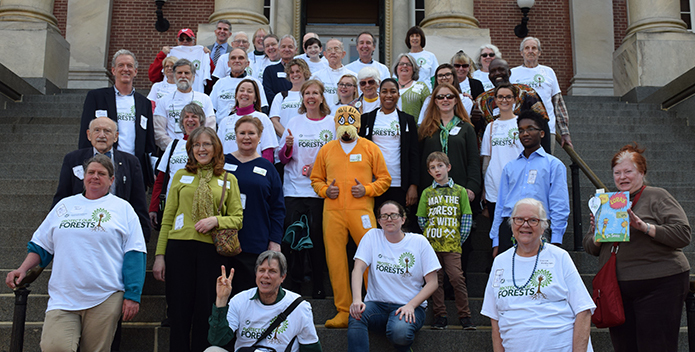 Volunteers gather on the steps of the statehouse in Annapolis after meeting with their representatives advocating for the Forest Conservation Act. To save the Bay, accepting the status quo is often not an option. This week, an unsustainable loss of Maryland's forests, and the lack of protection for a critical fish, prompted us to act. Increasing development paired with lax forest protections are wiping out thousands of acres of Maryland forests, and with them, one of our most successful resources in the fight to improve water quality. This unsustainable loss of forests is costing Maryland billions of dollars in benefits. Maryland's Forest Conservation Act (FCA), written in 1991, is supposed to protect forests from overdevelopment. But the Forest Conservation Act needs dramatic improvement. House Bill 766, sponsored by Delegate Healey, and Senate Bill 610, sponsored by Senator Young, updates the Forest Conservation Act to protect our most ecologically valuable forests. Dozens of advocates joined us in Annapolis on Tuesday for "Rally Your Reps" Day, meeting with their legislators and asking them to support HB 766 and SB 610. And you can help too. Marylanders, urge your legislators to support this critical legislation to protect our forests! Want to go one step further? We have joined a coalition of other organizations urging Maryland legislators to protect our forests. Sign this petition to join the chorus of voices calling for forest conservation. In Virginia, the General Assembly needs to approve the Atlantic States Marine Fisheries Commission (ASMFC) new menhaden management plan. Failure to pass legislation will put Virginia out of fisheries compliance and could lead to serious sanctions, including the shutdown of all menhaden fisheries in the Commonwealth, threatening the livelihoods of thousands of hardworking Virginians. House Bill 1610 makes required updates to Virginia's menhaden management plan and ensures a healthy population for the critical fish for years to come. Virginians, take action and urge your legislators to support HB 1610! If we want clean water for future generations, we can't sit on the sidelines. Join us in the fight to protect our forests and manage menhaden responsibly. Failing to act can put our environment, economy, and way of life at risk. Hopewell, VA: Join us to free park trees from harmful English ivy, a creeping vine that can damage trees by acting as a sail in high winds. This invasive species also is not as beneficial to our native pollinators as our trees and understory plants. RSVP to Blair Blanchette at bblanchette@cbf.org. Norfolk, VA: The Bay, the critters that call it home, the tourism economy, and the many jobs that depend on clean water all have something in common—they all could be dramatically impacted by oil and gas drilling off the Virginia coast. 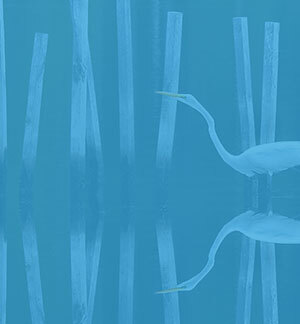 Join us for our next installment of our Blue Planet Forum, featuring a panel discussion on this pending threat, including Governor Ralph Northam, and titled Offshore Drilling: Perspectives to Consider. Click here to register! Virginia Beach, VA: Culinary experts have called oysters "the great undiscovered palate." With their unique flavors, characterized by the waters they live in, their complexity is comparable to the world's great wines. Join us for "From Bay to Vine, Oysters and Wine," as we explore the flavors of Bay oysters paired with Virginia wines, all while overlooking the birthplace of the American oyster industry in one of the greenest buildings in the world. Click here to register! Baltimore, MD: Waterfront Partnership and CBF's film series, "Docs from the Docks" continues, showing "Ocean Cities: Exploring Our Connection to the Sea." Click here to register! Monroe, VA: Join us for a workshop with information about creating habitat for critters, protecting water quality, and beautifying your property with native plants and trees. Click here for more information and to register!